The German Shepherd puppy that almost wasn't. 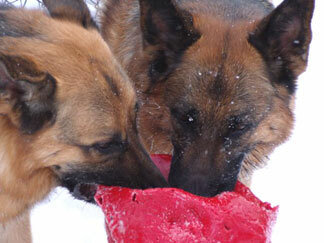 When I got with my husband Jack, little did I know that I would be adopted by a whole pack of German Shepherds! But now, not only is Jack the love of my life, so are my Shepherds! Currently, we have two adult females, Cinnamon and Lacey, and two 5 month old pups Belle and Lexi. The story I have to tell is about Belle. She is Cinnamon's pup and when she was born we did not know if she would live. A couple of weeks before she was born Cinnamon contracted CHV (canine herpes virus) from the dogs next store. She had seven puppies three days and four puppies out of the seven were still-born. The other two died in their sleep despite everything we could do. It was not until after these two left us that we figured out what Cinnamon had and that the only way to keep them alive was to keep their body temperature up. But little Belle pulled through. First it was one day, then she survived another. Before we knew it she had survived two weeks. It was the middle of summer and by this time she was able to crawl. And boy did she want out of that heated space! Her eyes weren't even open and she tried everything she could to crawl out of it. By 5 weeks we knew she was going to live but we still kept her warmer than she would have liked. After all of this I finally thought of the name that would be most appropriate for her. Belle Vie d'Longworth. It means Beautiful Life of Longworth in French. Today, at five months, she is active, loving and soo smart. She knows sit, down, and we are working on her leash manners. She has even learned how to open doors! Much to our dismay ha ha.